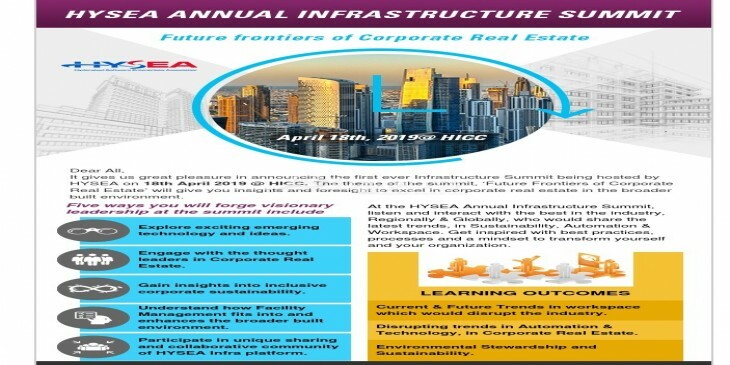 It gives us great pleasure in announcing the first ever infrastructure summit being hosted by HYSEA on 18th April [email protected] The theme of the summit , “Future Frontiers of Corporate Real Estate” will give the insights and foresight to excel in corporate Real Estate in the boarder built environment. At the HYSEA Annual Infrastructure Summit, listen and interact with the best in the industry, Regionally and Globally, who would share the latest trends in sustainability , Automation & Work space. Get inspired with best practices, process and a mind set to transform yourself and your organisation. • Explore exciting emerging technologies and ideas. • Engage with the thought leaders in Corporate Real Estate. • Gain insights into inclusive corporate sustainability. • Participate in the unique sharing and collaborative community of HYSEA Infra Platform. • Current and Future Trends in work space which would disrupt the industry. • Disrupting trends in Automation & Technology in Corporate Real Estate. • Environmental Steward and Sustainability.